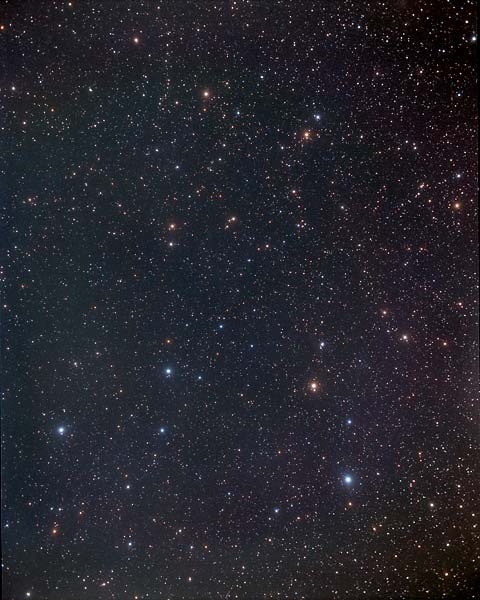 In the picture above north is at the top and the image covers 39.7 x 49.6 degrees. Image centre is located at 10:42:37.4, +29:06:32 (H:M:S, D:M:S, J2000) Astrometric data from Astrometry.net. Leo Minor the lesser Lion, is constellation of the northern Spring and was created by Johannes Hevelius (1611 - 1687), first published in his 1690 atlas Firmamentum Sobiescianum. He is believed to have named the star 46 Leonis Minoris 'Praecipua' because it was the principal star in his new and not very distictive constellation, which at 232 square degrees is 64th largest. Leo Minor is due north of the distinctive sickle shape in Leo (which has its own page), and south of the hind leg of Ursa Major, 'The Great Bear'. Constellations adjoining Leo Minor: Cancer, Leo, Lynx, Ursa Major. Adhafera (ζ Leo), Denebola	(β Leo), Algieba	(γ1 Leo), Al Minliar al Asad	(κ Leo), Alterf	(λ Leo), Chort	(Chertan, θ Leo), Praecipua	46 LMi, Ras Elased Australis	(Algenubi, ε Leo), Ras Elased Borealis	(Raslas, μ Leo), Regulus	(α Leo), Shir (ρ Leo), Subra	(ο Leo), Zosma	(δ Leo).